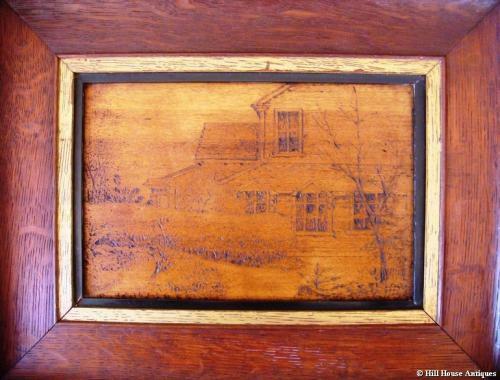 A charming and unusual pair of small oak wide framed pokerwork (pyrographic) panels of a house in San Francisco, by Charles Snellgrove (1863-1938); signed and dated to front 1911. These were apparently made as a gift for his brother John and his wife; showing back and front views of their house in 226 Putnam St, San Francisco, California in March 1911 (fully incised information to backs). Charles Snellgrove is a listed American artist; born in England in 1863 and by 1890 had settled in San Francisco, where he eventually died January 25th 1938. Ref : Edan Hughes, "Artists in California, 1786-1940"